James Bronger Sr., known to students as Mr. Jim, is more than just an employee at McAlister’s Deli. He’s the most wholesome thing to have ever graced this university. As a former TARC driver, Mr. Jim said he loved his passengers, and now at McAlister’s, he loves the students the same way. This is evident not only in the way he brightens students’ days, but also in the way he contributes small things behind the scenes. He said because McAlister’s only has unsweetened applesauce, he bought cinnamon, and he also bought cheesecake toppings. Despite his popularity, Mr. Jim stays humble. “I’m not patting myself on the back, that’s just the way I show you all how much I love and care for you guys,” he said. Students also show an incredible amount of love towards him. He has received cards from students and graduates for his birthday. Mr. Jim said students also recognize him off campus at U of L games and hospitals. Mr. Jim said he is proud of his students, and stressed how important it is to joke around and help others stay positive about upcoming exams. “Like your grandpa would do for you back home, this grandpa is going to do for you here,” he said. He wants to let students know he wishes them good luck, and is proud they made a decision to get a degree in in their fields of interest. He said college is much different from home, and college students work very hard. “There’s a lot going on for students, and I tip my hat to all of you all who go to college and do the best you can,” he said. Mr. Jim said there are two important things college students need to know. 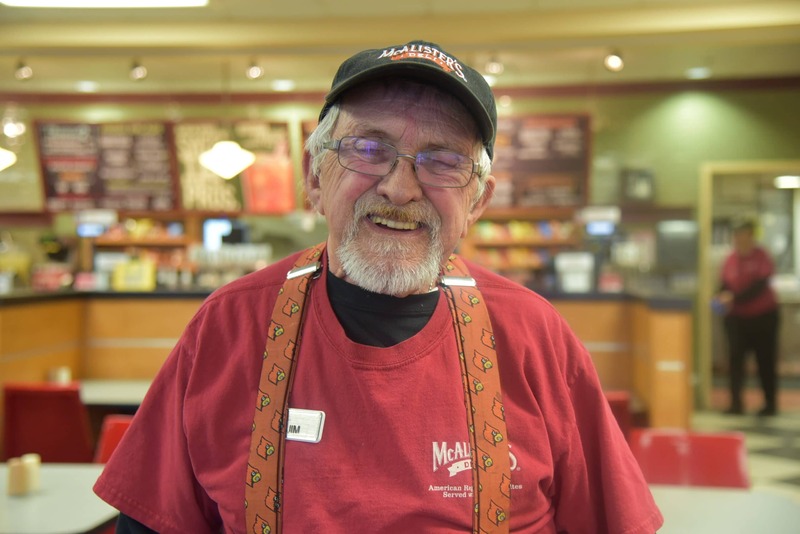 Mr. Jim said as long as his health is good, he will stay at McAlister’s and continue to put smiles on faces. WE LOVE EVERYTHING I HAVE TRIED……YUMMY!!! !